A New Approach to Healthy Hair! The Secret Weapon To Hair Growth! The number one question I hear from clients is “how do I get my hair to grow?”, or something along that line. Hair growth is the number one concern among women of African descent. 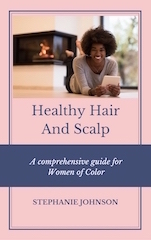 In fact, over 40% of African American women over the age of 30 report hair loss in the crown area and around the hairline. In this video, I reveal what I believe is the “secret weapon” to hair growth and the steps you can take to get your hair thriving again. How To Give Your Thinning Hair A Fighting Chance! My Client Had To “Check” Me!